Residents enjoyed a concert in Hamilton Park on Sunday July 9, sponsored by Mayor Richard Turner and the Township Council. Lucia Pardo Rea won first place in the Weehawken Elks Drug Awareness Essay Contest for sixth graders earlier this year. In February, she went on to win first place in the Elks East District. And on June 2 she won first place in the State of New Jersey for her essay. 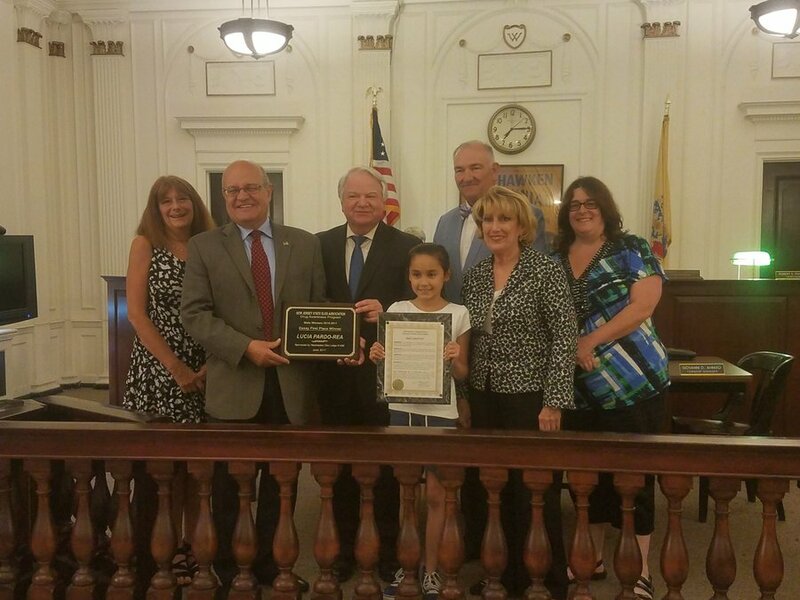 On June 28 she was presented with the state award and received a proclamation from Mayor Richard Turner and the Weehawken Town Council for her accomplishment. Pictured above are Lisa Rovito, Past Exalted Ruler and Drug Awareness Chair Weehawken Elks; Robert Sosa, Deputy Mayor; Mayor Richard F. Turner; Lucia Pardo Rea; Robert Zucconi, Rosemary Lavagnino, and Holly Pizzuta, Exalted Ruler. Praised by The New York Times as “a singer with a strong and luscious tone and an amiably regal presence on stage,” Alicia Olatuja will headline the latest free summer concert on the Hudson on Wednesday, July 26 at 7 p.m. at Lincoln Harbor Park, just north of the Chart House restaurant on the west bank of the Hudson River in Weehawken. The concert series is co-sponsored by the Hudson Reporter. The venue is reachable by light rail to the Lincoln Harbor stop and also by NJ Transit bus 158 from Port Authority and towns to the north. 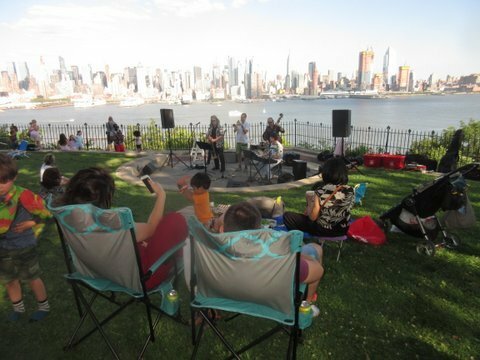 Free parking is available at the Weehawken Recreational Park and also in the parking deck behind 1000 Harbor Boulevard. Please use 1600 Harbor Boulevard for GPS directions. Concerts are family friendly. Limited seating is available; however, audience members are asked to bring a lawn chair or blanket, if possible, and encouraged to picnic on the lawn. A rain date, if needed, will be scheduled for the following night. For more information including the full summer concert schedule, directions, updates, and rain date info, please check the HRPAC website www.hrpac.org, or call the concert info line at (201) 716-4540. 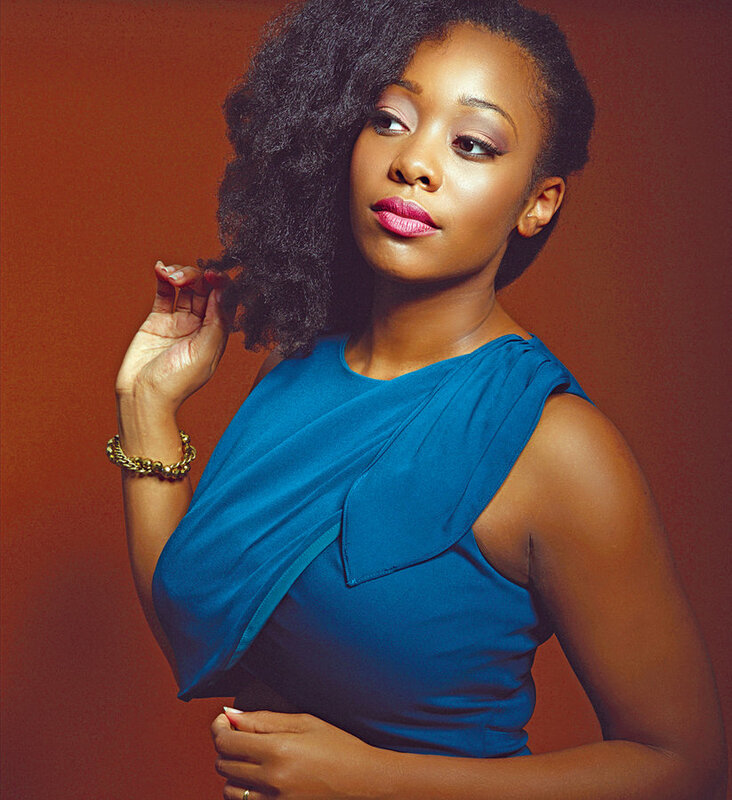 Olatuja first came into the national spotlight in 2013 while performing as the featured soloist with the Brooklyn Tabernacle Choir at President Barack Obama’s second inauguration. Shortly thereafter, she formed her own jazz-based ensemble and recorded her first solo album, Timeless. Originally from St. Louis, Alicia grew up immersed in a wide range of musical styles, including gospel, soul, jazz, and classical. This led her to the Manhattan School of Music from which she graduated with a Masters degree. After appearing in numerous operatic and musical theater productions, she started to perform more regularly in gospel and jazz concerts and worked with such esteemed artists as Chaka Khan, BeBe Winans, and Christian McBride. In 2014, Alicia came to the attention of the acclaimed composer/arranger/pianist Billy Childs, and he invited her to be part of his musical valentine to Laura Nyro, Map to the Treasure: Reimagining Laura Nyro. Alicia’s voice also impressed the legendary Hammond B3 organist, Dr. Lonnie Smith, with whom she performed at the Charlie Parker Festival and the BRIC JazzFest. Alicia’s own band has been steadily in demand nationwide and just completed a week at the legendary jazz club, Birdland. The state legislature and Gov. Chris Christie agreed on a state budget this month that includes a new school funding formula. Christie signed the budget into law early on the morning of July 4, ending the government shutdown that closed state parks and beaches over the holiday and moved Jersey City’s festival from Liberty State Park to Exchange Place. Statewide, the new formula will increase school funding by $181 million, with $25 million allocated to expand pre-k and kindergarten. Total state aid to public school districts totals over $9 billion, nearly a third of the overall state budget. However, not all local districts benefit. The new budget brings funding to more than 300 of New Jersey’s 584 school districts that have been perpetually underfunded since Christie signed the last funding formula law in 2008. Despite the additional funding, an estimated $2 billion gap remains between what the law required and the amount that was actually allocated. Jersey City will suffer a 2 percent reduction, or about $8.4 million. Hoboken will lose out to the tune of a 7.7 percent decrease, or about $825,000. Weehawken funding would decrease by about the same percentage. Meanwhile, Bayonne will receive six percent more than Christie’s “Fairness Formula,” which he introduced earlier this year, much to the chagrin of many urban school districts. Bayonne’s total increase amounts to $3.2 million, a partial but much-needed reprieve from the district’s $6 million budget deficit unearthed in November of 2016. Union City will get a 1.2 percent increase, or $2.1 million. Secaucus will receive a 13.1 percent increase, or $131,132. Guttenberg will also receive a roughly 13 percent increase for roughly $688,000. North Bergen will receive 2.2 percent, or $1.2 million. West New York will receive a 1.2 percent increase, for about $1.5 million. A 48-year-old woman, sentenced in Weehawken Municipal Court to 180 days, died at the Hudson County Corrections Center on July 14 as result of as yet undisclosed cause. James Kennelly, spokesperson for Hudson County, confirmed that Jennifer Towle, a resident of Hudson County, died in the jail’s infirmary at about 1:49 a.m.
Towle was serving 180 days in jail for driving while intoxicated. Because this was her third offense, this was a mandatory sentence, Kennelly said. Towle’s death comes a month after the death of Rolando Meza Espinoza, who died from internal bleeding and other issues on June 10 after he was transferred from the jail to Jersey City Medical Center. Unlike Towle, Espinoza was being held at the county jail as an U.S. Immigration and Customs Enforcement detainee for alleged immigration offenses. The reason for Towle’s death has yet to be determined. “The matter is currently under investigation,” Kennelly said. Hudson County Executive Tom DeGise and Freeholder Board Chairman Anthony Vainieri announced two weeks ago that the county administration and Board of Freeholders will cooperate in an independent review of the facts and circumstances surrounding the death of Espinoza, 35. Learn how to become a CASA (Court Appointed Special Advocate) volunteer and help foster children find safe and permanent homes. The next information session will be at Little City Books at 100 Bloomfield St., Hoboken on Tuesday, July 25 at 7 p.m. Hudson County Court Appointed Special Advocates (CASA) is a non-profit organization committed to advocating for the best interests of abused and neglected children. CASA works through trained community volunteers to ensure that needed services and assistance are made available to children while helping to move them toward safe and permanent homes. Hudson County CASA volunteers are everyday people who make a direct impact in foster children’s lives. They are trusted, dedicated adults who seek to improve children’s well-being. CASA volunteers get to know their assigned child and his or her circumstances and provide valuable information to the court. Judges rely on the volunteers’ recommendations to make the best decisions about the children’s futures. The U.S. Department of Housing and Urban Development (HUD) today awarded $716,894 in housing counseling grants to 9 local organizations in New Jersey to help families and individuals with their housing needs and to prevent future foreclosures. In Hudson County, North Hudson Community Action Corporation will receive $18,348.00 for Comprehensive Counseling. North Hudson Community Action Corporation (NHCAC) was founded in 1965 as a Community Action Agency (CAA) to address the immediate needs of low-income residents, to continue assistance until stability and eventual self-sufficiency is achieved. Grant recipients address the full range of families’ housing counseling needs. This includes helping homebuyers evaluate their readiness for a home purchase, understand their financing and down payment options, and navigate what can be an extremely confusing and difficult home buying process. The organization also help households find affordable rental housing and offer financial literacy training to individuals and families struggling to repair credit problems that restrict their housing options. In addition to providing counseling to homeowners and renters, these organizations assist homeless persons in finding the transitional housing they need to move toward a permanent place to live. Finally, grantees also assist senior citizens seeking reverse mortgages. You can join a unique PhD research study assessing the human impact of Healthcare Reform. Ongoing changes to health care have triggered new demanding challenges for health care professionals working with diverse populations in U.S. health care systems. A Deloitte & Touché survey of 400 organizations highlighted that employee resistance to change is the number one reason organization change initiatives fail, and determined organizational readiness is a critical factor in the process of achieving successful change in organizations. You can participate when and where it is convenient. The assessments only take minutes to complete. Register and participate to receive a free workbook and join a raffle for one Apple store $500 gift certificate. To find out if you qualify just answer Yes/No to the screening questions at www.organizationalreadinessresearch.net where you can also learn more.